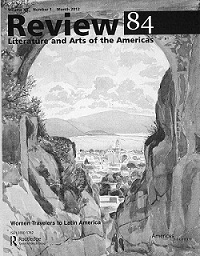 Review 84, guest-edited by Méndez Rodenas, covers seminal women travelers in Latin America such as Flora Tristan, the French-Peruvian writer and social activist, as well as contemporary writers who address the theme of travel. Scholarly contributions include essays by critics on Tristan; on writer, artist, and ecologist Maria Sibylla Merian, who traveled to Suriname in 1699 to research and document insects and flora; on Victorian Scotswoman Lady Florence Dixie, who wrote about her adventures in Patagonia; and on Countess Paula Kollonitz, the lady-in-waiting to Empress Carlota, during Maximilian’s ill-fated reign in Mexico. The essays are complemented by illuminating texts by the travelers themselves. Other contributions include fiction by modern and contemporary writers, including the late Antonio Benítez-Rojo, Argentine novelist Pola Oloixarac, Mexico-based U.S. author Michael Schuessler, and Chilean writer Carlos Franz. The issue also features an essay by art critic Alicia Lubowski on the influence of Humboldt on women traveler-artists and includes reviews of new titles in translation by Latin American and Caribbean writers. Learn more or purchase Review 84. Subscribe to the magazine.